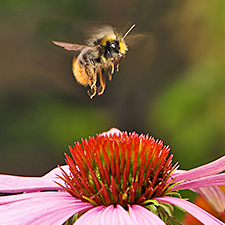 Wasps, Hornets, Yellow Jackets and Bees can all cause issues, especially if you are allergic to their stings. It is good to note that we do not destroy honeybees. If there is an unwanted colony, we will call in a professional honeybee keeper to remove and relocate the bees. The eastern yellowjacket is a ground nesting species found throughout most of the eastern United States – from North Dakota to Texas and east to the Atlantic coast. It is very common in woodlands, pastures, parks and lawns. Occasionally, in northern urban areas, it has been recorded nesting within wall voids of various structures – including homes. Vespula maculifrons, a native species, will aggressively defend its nest and can sting repeatedly. 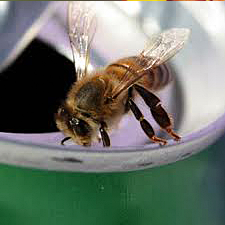 The stings are painful and for sensitive/allergic individuals this can pose a serious health risk. V. maculifrons workers, all sterile females, are approximately 12 mm (1/2 inch) in length; queens are slightly larger – up to 18 mm. They are black with yellow markings. The first abdominal segment has a wide, anchor-shaped black marking (dorsally) and the cheek (side of the face) has a continuous yellow band that does not completely encircle the eye. In Pennsylvania, overwintered queens begin nest development in May or early June depending on the spring temperatures. Queens select nest sites in forest floors, rock walls, creek banks, lawns and occasionally within structures. The first brood of workers appear in June and from that point onward the founding queen remains within the nest. Males are produced in August/September, closely followed by a brood of new queens. Fertilized queens overwinter in protected locations such as under bark of dead trees or logs, in leaf/forest litter and other protected areas. Eastern yellowjackets can be considered a beneficial insect because they reduce populations of unwanted insects such as earwigs and caterpillars. Therefore, unless the nests are located close of an entrance to a building, in the ground of a lawn that is mowed, or in any area where the public is likely to encounter them, the nests can be ignored. However, individuals with known sensitivities to wasp and bee stings should have all nests in close proximity to their homes removed by professional pest management personnel (pest control companies). Additionally, any nests located within the walls/attic of a home should be treated by professionals because of the difficulties associated with this type of treatment. NEVER attempt to control yellowjackets in a wall by plugging the opening. This can result in the yellowjackets chewing through the interior sheetrock walls and entering the home. The baldfaced hornet is an ‘aerial yellowjacket’ – one of 7 or 8 species in the genus Dolichovespula in North America. However, it is not a ‘true’ hornet – it is a yellowjacket. The only hornet in North America is the European hornet, Vespa crabro, and it is an accidentally introduced species. All of the yellowjackets in the genus Dolichovespula build nests in bushes and trees (sometimes on the outside of buildings), and produce the characteristic football shaped, grey papery nests. The baldfaced hornet is found in most of the 48 contiguous states and D.C., throughout Canada and in Alaska, and is the most common of the species in Dolichovespula in Pennsylvania. The baldfaced hornet gets its name from the ivory-white markings on the face. The thorax, legs and abdomen also have white markings. The queen and her offspring range in size from 13 mm to 20 mm – the queen is usually the largest yellowjacket in the colony. In the spring, fertilized queens that have overwintered in protected places such as in hollow trees, rock piles, under bark and in the walls and attics of buildings, become active and begin to build a nest. The queen collects cellulose from weathered and rotting wood, chews the wood adding her saliva, and takes this paste and makes a papery material to construct the nest. She creates a few brood cells within the nest and deposits eggs in them and feeds the larvae when they hatch. This first brood will assume the duties of nest building, food collection, feeding the larvae and protecting the nest. As the summer progresses, the colony grows until there may be 100 to 400 workers. In Pennsylvania, a large colony will have upwards of 300 individuals. Nests are usually located in bushes and shrubbery – at least 3 feet off the ground – and in trees as high as 60 feet or more, and are sometimes found under the eaves of buildings and other man-made, protected locations. They are a grey color and in Pennsylvania can reach up to 24 inches in height and 18 inches across.2. Baldfaced hornet nest. Early in the spring and summer, protein in the form of live prey is the usual diet consisting of flies, other yellowjackets and many other types of insects. Some nests are so full of yellowjacket remains that the inside has a yellowish cast to it. As the season progresses and there are fewer larvae to feed, the workers will take nectar and other forms of carbohydrates. Most of the colony, other than newly fertilized potential queens that will overwinter, will die before or shortly after the first hard frost. Baldfaced hornets can be considered a beneficial insect in that they reduce populations of unwanted insects (including other yellowjackets) and will help pollinate flowers when they are searching for nectar. Therefore, unless the nests are located close (within 10 feet) of an entrance to a building, under an eave that is close to the ground or in shrubbery next to a lawn that is mowed, the nests can be ignored. However, individuals with known sensitivities to wasp and bee stings should have any nests close to their homes removed by professional pest management personnel (pest control companies). Before 1981, the European paper wasp was not recorded in North America. In its native region, P. dominula is the most abundant paper wasp in those countries around the Mediterranean. It is also found in southern Europe, northern Africa, the Middle East, and eastward into China. A highly successful colonizer, this wasp has rapidly increased its distribution in the United States during the past 20 years. Before the introduction of this new species, the northern paper wasp, Polistes fuscatus , was the most frequently encountered species in and around structures in Pennsylvania. P. dominula is frequently mistaken for a yellowjacket. Smaller than the native northern paper wasp, the European paper wasp (Images. 1 & 2) is yellow and black, resembling the pattern (especially on the abdomen) of the yellowjackets in the genus Vespula. As in all paper wasps, the “waist” is very thin. During flight, the hind pair of legs trail below in an extended fashion. The nest is the characteristic upside-down umbrella shape, and the open cells can be seen from below. Cream-colored larvae are legless and remain within their cells until they emerge as adult wasps. 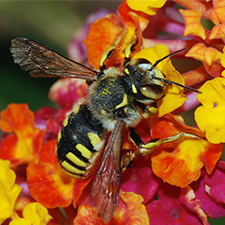 P. dominula was first discovered near Boston, in Cambridge, Massachusetts, during the late 1970s. Since then, the wasp has been recorded from Maine, Vermont, Connecticut, New York, New Jersey, Maryland, Pennsylvania, Ohio, Virginia, Michigan and Wisconsin. It has recently been discovered in California, Colorado and Washington. Fertilized queens from the previous year begin new colonies of P. dominula each spring. These queens overwinter in protected areas such as under the bark of dead trees, in hollow trees, within wall voids of houses, under siding and occasionally within the cells of a paper wasp nest. Although most nests are newly constructed each year, the queens will sometimes use a previous year’s nest, thereby establishing their colonies earlier in the season than our native species. The queen deposits small, elongated eggs (one to a cell) that hatch in several days. She will feed her young larvae masticated caterpillars and other insects. In contrast, our native species of Polistes prey only on caterpillars. After the first brood of larvae mature and emerge as worker females, the queen will limit her activity to laying eggs to expand the number of workers. The workers assume the duties of food collection, nest construction, and colony defense. With optimal temperatures and a plentiful food source, the larvae complete their development and become adult wasps in as little as 40 days. Nests are constructed in protected locations such as under and within the eaves of structures, in attics and wall voids, and in many other enclosed areas. Some of the more notable locations where nests have been encountered include exterior lighting fixtures, parking meters, animal skulls, bird boxes, and infrequently used equipment like gas grills, motor homes, boats, and autos. A more varied diet (many different genera of insects in several orders) benefits early and rapid larval development. European paper wasps are very attentive to potential threats to their nests. They can detect movement at 12 to 20 feet from the nest but fortunately do not typically attack unless people are very close (inches away). However, since they prefer to hide their nests within voids and other enclosures, this behavior increases the risk for unpleasant encounters. An unsuspecting homeowner may be stung, for instance, while attempting to change a lightbulb for an outside fixture, or while painting or removing window shutters. Furthermore, observations in Pennsylvania indicate that these wasps are extremely common in urban settings. Whenever new species are introduced into an environment (either intentionally or accidentally), there are unpredictable consequences. The increased risk for stings is an obvious concern. Even more troubling, it appears that this new introduction has had an adverse impact on the native species of Polistes . The apparent reduction of indigenous Polistes will undoubtedly result in a change in the faunal balance. It is unclear what the consequences will be. Some entomologists worry that the large numbers of P. dominula will adversely affect the species of desirable insects (i.e., butterflies). Every attempt should be made to limit suitable nest sites. Repair holes in walls, caulk cracks in soffits and eaves, and screen vents and louvers. Nests made early in the season by founding queens are easier to eliminate before workers are produced. During this period it is easy to knock down exposed nests and kill the queen. Nests that have several workers can be treated with a wasp and hornet spray. These sprays produce a stream of insecticides that can shoot up to 20 feet from the nozzle. Treatments should be made at night when all the workers and the queen are on the nest. Those nests located within eaves and soffits can be treated by applying an insecticidal dust to the openings of the voids. Blow the dust into the opening, taking care not to breathe dust that becomes airborne. Select a dust that is labeled for this type of application. Appropriate dusters available include bulb dusters and plunger or pump dusters. Pest control firms also provide services to control paper wasps.